It Follows director David Robert Mitchell should be very flattered by Blumhouse’s Truth Or Dare, a film that takes the sophisticated artistry and paralyzing terror of his horror hit and waters it down into sloppily assembled teen genre fare that produces more giggles than gasps. The film creeps right up to the edge of rip-off, contorting the premise into something much sillier while borrowing themes, imagery, and, at one point, even the lighting scheme from Mitchell’s film. (See the photo above.) Here, the demon is not transmitted sexually, but by agreeing to play a game of truth or dare. But the demon does follow you and your friends home afterwards, where it can appear at any time, in any form, and demand that you take your “turn.” The only way to get rid of it? To pass the curse on to others. The opening is as generic as they come: Good-girl college student Olivia (Lucy Hale) gets talked into abandoning her plans to spend spring break volunteering for Habitat For Humanity by her BFF Markie (Violett Beane), who drags her along for a debauchery-filled week getting wasted in Tijuana instead. (Cue the Snapchat montage.) On their last night in Mexico, Olivia, Markie, and their one-note friends end up trekking out to a creepy abandoned church, where mystery man Carter (Landon Liboiron), who Olivia met at the bar earlier that night, initiates a game of truth or dare. Asked to tell the truth about “your intentions with our sweet Olivia,” Carter blurts out, “I’m okay with strangers dying if I get to live!” and runs out of the room. Markie is more upset that one of their friends implied Olivia like-likes her boyfriend Lucas (Tyler Posey). Our gang of largely interchangeable undergrads doesn’t think a single thing of the incident, until Olivia is confronted one afternoon by a twisted face with glowing red eyes that older viewers may find reminiscent of Aphex Twin’s “Come To Daddy” video but one of the characters describes as “a messed-up Snapchat filter.” (Kids these days.) The face demands that Olivia choose between “truth” and “dare” in a metallic voice that sounds a bit like a more sinister Speak & Spell; she chooses “truth,” and ends up screaming one of Markie’s biggest secrets to a library full of shocked students. Obnoxious bro Ronnie (Sam Lerner) is less lucky, and ends up breaking his neck falling off of a pool table after chickening out on a dare. The game has begun anew. 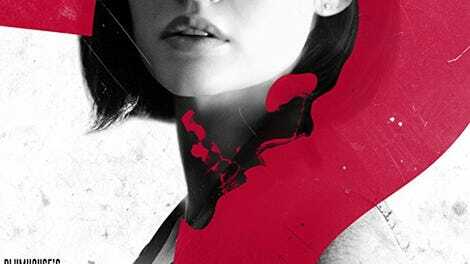 Truth Or Dare is rated PG-13, and sometimes has the feel of an R-rated horror movie that’s been edited down to score a lighter rating. A brief scene where one character is dared to strip down naked is cut so heavily that it’s incomprehensible, and while some of the kills are suitably diabolical, they’re shot from angles that obscure the true extent of the bloody action. (This may have also been a budgetary consideration: It’s cheaper to film blood seeping out from underneath a door than to make a gory prosthetic.) Less easily explained is the film’s tendency to cut away during dramatic emotional moments, like the scene where Brad (Hayden Szeto), whose single character beat is that he’s gay and afraid to come out to his violently homophobic father, is ordered by the face to tell his dad the truth. Cut to Brad skipping happily toward his friends in the next room, where he tells them what just happened. Brad’s is just one of the clumsily handled familial subplots in the film, all jarringly dark compared to the sheer silliness of the painfully contrived exposition and pandering, repetitive dialogue. (There are several scenes where Markie storms out of a room screaming some variation on, “Screw you, Olivia!” but only in one of them does she pop back into the room seconds later.) These absurd tonal shifts are less offensive, though, than simply a buzzkill, as it’s hard to have a hearty, derisive laugh at a ridiculous plot point when it involves a parent committing suicide. It’s a muddled, contradictory, confusing mess, made even more so by the darkly cynical streak that runs through the film. Truth and integrity don’t really matter, Truth Or Dare posits, and the only way to survive in this world is by screwing over as many people as possible. At least something about this movie is surprising.